Purpose The impact of thrombus length on recanalization in IV thrombolysis for acute intracranial artery occlusion has been well studied. Here we analyzed the influence of thrombus length on the number of thrombectomy maneuvers needed for recanalization, intraprocedural complications, recanalization success, and clinical outcome after mechanical thrombectomy. Methods We retrospectively analyzed angiographic and clinical data from 72 consecutive patients with acute occlusion of the M1 segment of the middle cerebral artery who were treated with mechanical thrombectomy using stent retrievers. Successful recanalization was defined as a Thrombolysis in Cerebral Infarction score of 2b or 3. Good neurological outcome was defined as a modified Rankin Scale score of ≤2 at 90 days after stroke onset. Results Mean thrombus length was 13.4±5.2 mm. Univariate binary logistic regression did not show an association of thrombus length with the probability of a good clinical outcome (OR 0.95, 95% CI 0.84 to 1.03, p=0.176) or successful recanalization (OR 0.92, 95% CI 0.81 to 1.05, p=0.225). There was no significant correlation between thrombus length and the number of thrombectomy maneuvers needed for recanalization (p=0.112). Furthermore, thrombus length was not correlated with the probability of intraprocedural complications (p=0.813), including embolization in a new territory (n=3). Conclusions In this study, thrombus length had no relevant impact on recanalization, neurological outcome, or intraprocedural complications following mechanical thrombectomy of middle cerebral artery occlusions. Therefore, mechanical thrombectomy with stent retrievers can be attempted with large clots. The impact of thrombus length on recanalization in IV thrombolysis in acute ischemic stroke has been well studied. In 2011, Riedel et al1 found that recanalization with IV thrombolysis in anterior circulation stroke was unlikely if thrombus length exceeded 8 mm. It has also been reported that thrombus length is a predictor of recanalization rates after bridging thrombolysis before mechanical thrombectomy.2 However, data on the impact of thrombus length on successful mechanical recanalization are sparse.3 ,4 Here we analyzed the influence of thrombus length on the number of thrombectomy maneuvers needed for recanalization, recanalization success, intraprocedural complications, and clinical outcome after mechanical thrombectomy for acute occlusion of the middle cerebral artery. Between January 2012 and October 2015, all consecutive patients undergoing mechanical thrombectomy for the treatment of acute ischemic stroke were collected in a prospective database and analyzed retrospectively. Inclusion criteria for the study were acute occlusion of the M1 segment of the middle cerebral artery, premorbid modified Rankin Scale (mRS) score of ≤2, and primary usage of the Solitaire FR (Medtronic, Dublin, Ireland) or the Trevo device (Stryker Neurovascular, Fremont, California, USA) as a stent retriever. Patients who underwent additional stenting of intracranial or extracranial vessels were excluded. The study was approved by our local ethics committee. Baseline demographic data, initial National Institutes of Health Stroke Scale score, and mRS score at 90 days after stroke onset were regularly documented by a neurologist. Good neurological outcome was defined as an mRS score of ≤2 at 90 days. Thrombectomy maneuver counts using a stent retriever were regularly reported by the performing interventional neuroradiologist. The recorded information included usage of any secondary stent retriever during thrombectomy which was not limited to the Solitaire or Trevo. Sole aspiration attempts of the thrombus using a distal access catheter were not evaluated as a thrombectomy maneuver and were excluded. Image analysis was performed blinded to the clinical information. Maximum thrombus length was assessed on pre-interventional MRI or CT scans. Thrombus length was evaluated from measurements on at least two perpendicular planes on multiplanar reformatted MR angiography or CT angiography images by determining the point of contrast truncation and the distal point of vascular refilling (figure 1). 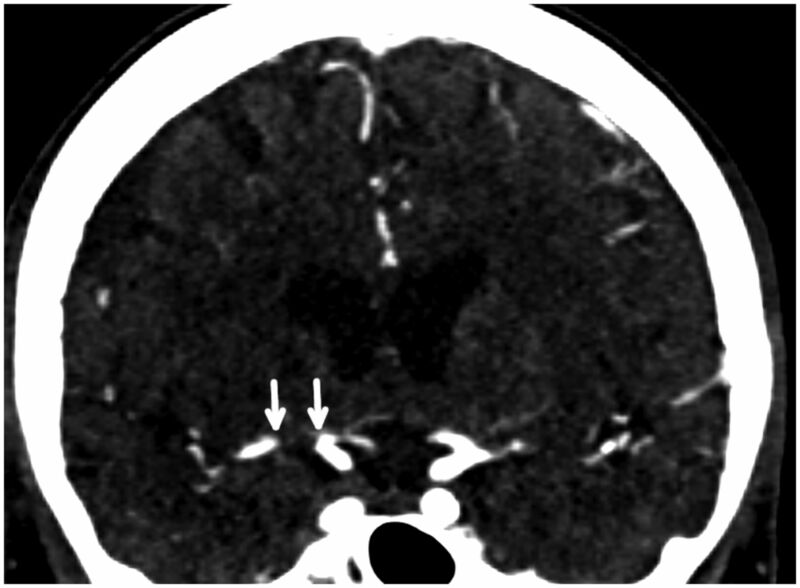 When there was doubt about the distal extent of the thrombus, susceptibility weighted MR sequences or non-enhanced CT scans were additionally used to estimate thrombus length.3 ,4 If a thrombus extended into several branches of the middle cerebral artery, only the maximal thrombus length was evaluated rather than all of the branches involved. Thrombolysis in Cerebral Infarction (TICI) scores were assessed on final angiographic series. A TICI score of 2b or 3 (subtotal or complete perfusion) was regarded as successful recanalization. Coronal reformation of contrast enhanced CT angiography. White arrows indicate a thrombus in the right middle cerebral artery. All statistical analyses were performed using RStudio V.0.99. The Shapiro–Wilk test was used to test for normality. Binary logistic regression analysis was used to examine the influence of thrombus length on recanalization, clinical outcome, and intraprocedural complications. The Mann–Whitney U test was used for non-parametric univariate analyses. The correlation between thrombus length and maneuver count was evaluated using Pearson's correlation. Statistical significance was set at p<0.05. Of the 474 patient records reviewed, 72 patients met the inclusion criteria for this retrospective study. The demographic characteristics of the patients are shown in table 1. Thrombus length was distributed normally (p=0.211) (figure 2). Mean thrombus length was 13.4±5.2 mm. Median number of thrombectomy maneuvers needed for recanalization was 2 (IQR 1–4). There was no significant correlation between thrombus length and maneuver count (r=0.19, p=0.111). Histogram of thrombus length. 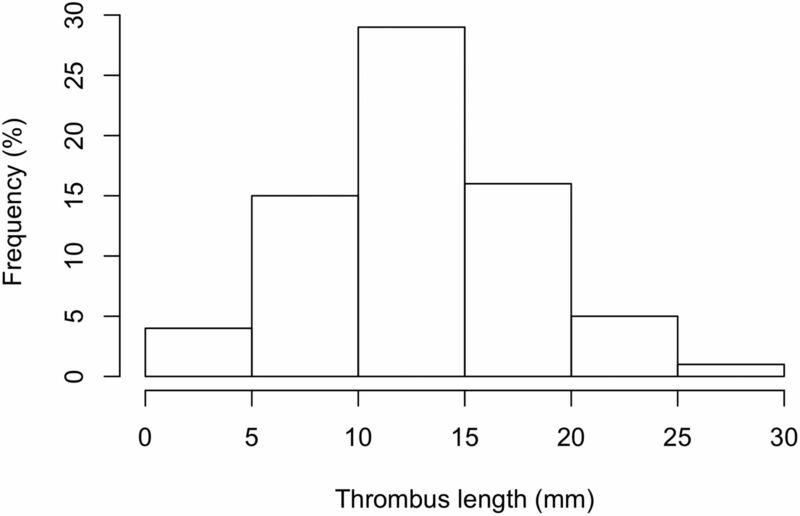 Thrombus length was normally distributed, ranging from 1 to 30 mm. Mean thrombus length was 14.1±5.0 mm in patients with atrial fibrillation and 13.2±5.2 mm in patients without atrial fibrillation. There was no association between atrial fibrillation and thrombus length (p=0.472). Also, IV thrombolysis had no influence on thrombus length (p=0.732). All patients had a TICI score of 0 prior to thrombectomy. Successful recanalization was achieved in 86.1% (n=62) and a good clinical outcome was achieved in 36.1% (n=26). Thrombus length was slightly, but not significantly, lower in patients with successful recanalization (12 vs 15.5 mm, p=0.163) and good neurological outcome (12 vs 14 mm, p=0.288) (figure 3). In binary logistic regression, there was no significant association between thrombus length and the probability of successful recanalization (OR 0.92, 95% CI 0.81 to 1.05, p=0.225) and good clinical outcome (OR 0.95, 95% CI 0.84 to 1.03, p=0.176). Box and whisker plots showing that thrombus length was slightly, but not significantly, lower in patients with (A) successful recanalization (p=0.225) and (B) good neurological outcome (p=0.176). The total rate of intraprocedural complications was 14%, resulting from asymptomatic subarachnoid hemorrhage (n=2), mild reversible vasospasm of the cerebral arteries (n=6), vessel dissection without hemodynamic impairment of cerebral perfusion (n=2), and embolization in a new territory (n=3). No symptomatic intracranial hemorrhage during thrombectomy was observed. No association was found between thrombus length and intraprocedural complications (OR 1.02, 95% CI 0.89 to 1.15, p=0.813). In recent prospective controlled thrombectomy trials, failure of vessel recanalization has been reported in 12–41.3% of stroke patients (13% in the present study).5–10 Here we analyzed the impact of thrombus length not only on recanalization, but also on intraprocedural complications and neurological outcome after mechanical thrombectomy for acute middle cerebral artery occlusion. In 2011, Riedel et al1 noted that recanalization with IV thrombolysis in anterior circulation stroke was unlikely if thrombus length exceeded 8 mm. According to our results, modern stent retrievers, such as the Solitaire and Trevo devices, were able to remove long thrombi effectively. Thrombus length measured on MR angiography and CT angiography was not correlated with recanalization (p=0.225) or neurological outcome (p=0.176) in mechanical thrombectomy. Also, thrombus length did not correlate with the number of thrombectomy maneuvers required for recanalization (p=0.111). Likewise, the complication rate, in particular embolization into new territories, was not correlated with thrombus length (p=0.813). Therefore, we believe that large clots should not be regarded as a predictor of futile recanalization. Weisstanner et al,3 who compared thrombus location in MR angiography with susceptibility weighted imaging, did not find a correlation between thrombus length estimated in susceptibility weighted images and recanalization. In contrast, Soize et al4 reported that thrombus length measured on susceptibility weighted images on MRI had an impact on recanalization and neurological outcome after thrombectomy. In their study, however, occlusions of the anterior and posterior circulation and also tandem occlusions of the internal carotid artery and the middle cerebral artery were included, which may have influenced the results. Our study has several limitations. Our analyses were performed retrospectively but the data were collected in a prospective database. The methods used for thrombus length evaluation were the same used as those used in previous clinical studies.2–4 ,11 Bifurcation of thrombi was not evaluated. Use of the Solitaire or Trevo as a primary thrombectomy device was an inclusion criterion. The reported maneuver counts, however, included use of any additional stent retriever during thrombectomy and cannot be attributed to a specific stent retriever. Also, patients with complete recanalization on the initial cerebral angiogram were excluded, which might have had an influence on our results. More likely reasons for failure of mechanical thrombectomy include clot composition, density, and diameter, which we did not address in our study.12 ,13 Further experimental and clinical studies are needed to determine their importance in mechanical thrombectomy. Thrombus length had no significant impact on recanalization success, neurological outcome, or intraprocedural complications in mechanical thrombectomy for middle cerebral artery occlusions. Therefore, mechanical thrombectomy with stent retrievers can be attempted for large clots. Perhaps other factors, such as clot composition, density, and diameter are more relevant for successful mechanical recanalization and outcome. The abstract of this manuscript has been published in the abstract book of the 2016 Annual Conference of the German Society of Neuroradiology. Contributors FS, MP, MB, and MAM conceived the study and initiated the study design. JP, MW, CH, SN, and SS contributed to acquisition, analysis, and interpretation of the data for this work. All authors contributed to refinement of the study protocol, and reviewed and approved the final manuscript. Competing interests JP has received travel expenses from Siemens and Stryker. CH has received travel expenses from Covidien. SN has received consulting honoraria, speaker honoraria, and travel support from Boehringer-Ingelheim, Bayer, Pfizer, and Brainomix Ltd. MP has received speaker honoraria and travel reimbursement from Penumbra and Covidien. MB has received consulting honoraria and speaker honoraria from Codman, Guerbet, Novartis, Roche, Bayer, Teva, and Vascular Dynamics. MAM has received consulting honoraria, speaker honoraria, and travel support outside this work from Acandis, Codman, Covidien, MicroVention, Phenox, and Stryker. Ethics approval The study was approved by the institutional review board of Heidelberg University.